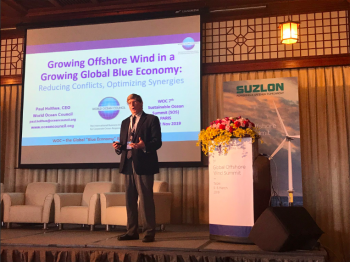 WOC CEO Paul Holthus attended the 1st Global Offshore Wind Summit held in Taipei on 5-6 March as Opening Plenary Keynote Speaker. CEO Holthus focused on the importance of collaboration between the growing offshore wind sector and other ocean industries. He highlighted the opportunities for compatibility among economic activities and infrastructure, which can create synergies in the use of ocean space. Holthus addressed the need for cross-sectoral business interaction to proactively tackle the real or perceived conflicts among sectors that may slow the growth of much needed renewable, low carbon energy from the sea, which must advance in concert with other responsible ocean users. WOC Members were eligible for an exclusive 30% discount on the registration fee for the 1st Global Offshore Wind Summit.